Mary Slim comission Wild Group to wrap their pioneering, groundbreaking custom built yacht. Richard & Mary Reddyhoff commissioned The Wild Group to design and wrap their pioneering, groundbreaking custom built yacht. As a cruising wave piercer she is the first of her kind and so how she would behave in big seas had been a matter of theoretical probability until her unveiling during an exclusive ceremony at Plymouth’s historic Royal William Yard. The Wild Group were proud to be involved with such a fantastic project. 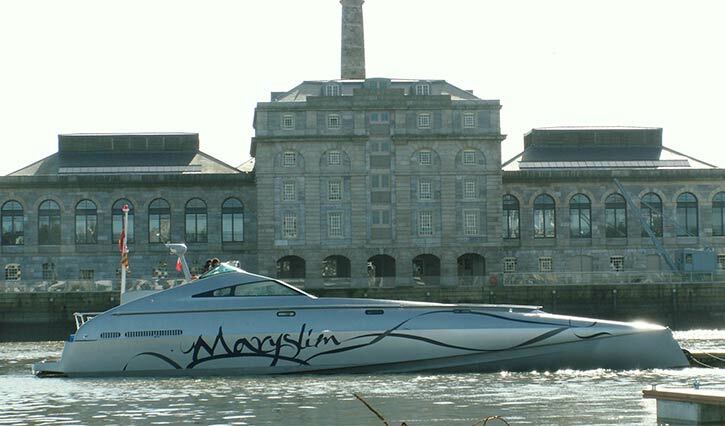 The incomparable very slender vessel Mary slim was built by Multimarine composites and went on to win the judges’ special award at IPC’s Motor boat of the year awards in 2008. ‘Until recently limited to military craft, the wave-piercing attributes of the Very Slender Vessel (VSV) design has now made its way into the civilian boat world in the form of the MarySlim, a stunning 72-foot, £1.5 million, long-range cruiser built by Cornwall based Multimarine Composites that debuted last year at the Royal William Yard in England. 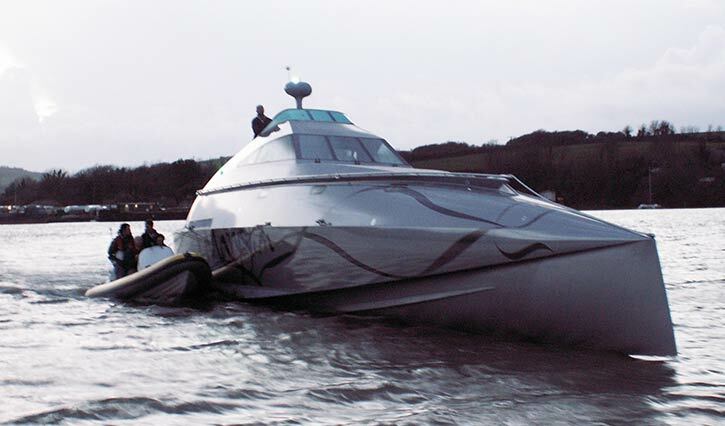 The unique shape of the yacht allows it to cleave through waves, eliminating the power-consuming, bruising bounce of other crafts, and allowing users to explore greater areas through harsher weather conditions. Powered by a 1650 hp, V12, twin turbocharged Caterpillar engine and a Rolls Royce KaMeWa water jet, the MarySlim has a range of 1800 nautical miles, a cruising speed of 30 knots, a top speed of 37 knots and a large windscreen which can withstand the pressure of 50 tons of water. Military applications for the VSV design have achieved even greater speeds with the 53 feet long craft used by Britain’s marine special forces unit since 1990 capable of more than 60 knots. Below deck, the nature of the design’s narrow length/beam ration of 4.8 obviously puts limitations on the available living space, but the 72 foot craft still has room for an three berth cabins including the main en suite cabin and a six-seat dinnette underneath the three seat helm.